Our previous article review (here) covered an article published in February of 1991 with the title "Inherited Amyloidosis." I noted that the phrase "hereditary renal amyloidosis" did not appear in that article, and it was not discussed much at all, most likely due to its rarity when compared to the hereditary forms of amyloidosis that cause FAP (Familial Amyloidotic Polyneuropathy.) In fact, the discussion of a kindred in which renal failure was the usual cause of death was part of the FAP Type 1 discussion. 1990 (October): First apolipoprotein A1 mutation identified. (This was the kindred discussed in the 1991 "Inherited Amyloidosis" article. 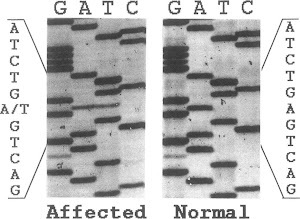 1992 (August): Same apolipoprotein A1 mutation reported in another kindred. So that's an overall big picture of what was known about the causes of hereditary renal amyloidosis in the early 1990s. Going forward we can concentrate on fibrinogen mutations, starting with the first two that were discovered. Today's post will review two articles, but I only have one of them. As indicated above, these are the first articles that identify a genetic mutation of fibrinogen as the cause of hereditary renal amyloidosis. Three members of a family who died with renal amyloidosis were found to share a single nucleotide substitution in the fibrinogen alpha-chain gene. The predicted arginine to leucine mutation (Arg554Leu) was proven by amino acid sequence analysis of amyloid fibril protein isolated from postmortem kidney of an affected individual. Direct genomic DNA sequencing and restriction fragment length polymorphism analysis demonstrated that all three affected individuals had the guanine to thymine 4993 transversion. This is the first demonstration of hereditary amyloidosis associated with a variant fibrinogen alpha-chain. Variants of circulating fibrinogen may be the cause of a number of systemic amyloidoses with primarily renal involvement. So now we know the first description of a fibrinogen mutation causing amyloidosis was published in 1993, and this mutation was discovered by Dr. Benson's team at the Indiana University School of Medicine. Although I don't have this article I do know a little about the family based on what is written about this article elsewhere. They were of Mexican and Peruvian descent, with family members having kidney issues as early as age 24. One member of the family had a kidney transplant at the age of 40 but died 10 years later after the transplanted kidney showed signs of amyloidosis. I find the last sentence of the abstract interesting because it is anticipating that there may be additional variants of fibrinogen that cause hereditary renal amyloidosis. Sure enough, this same team published a report on another fibrinogen mutation one year later. Two families with hereditary renal amyloidosis were found to have a novel mutation in the fibrinogen A alpha chain gene. This form of amyloidosis is an autosomal dominant condition characterized by proteinuria, hypertension, and subsequent azotemia. DNAs of patients with amyloidosis were screened for a polymorphism in fibrinogen A alpha chain gene by single-strand conformation polymorphism analysis, and affected individuals from two kindreds were found to have a mutation. Both of these kindreds are American of Irish descent presenting with non-neuropathic, nephropathic amyloidosis in the fifth to the seventh decade of life. DNA sequencing showed a point mutation in the fibrinogen A alpha chain gene that is responsible for substitution of valine for glutamic acid at position 526. By restriction fragment length polymorphism analysis, 7 affected individuals and 14 asymptomatic individuals in these two kindreds were positive for the fibrinogen A alpha chain Val 526 gene. Fibrinogen was isolated from plasma of a heterozygous gene carrier and shown to contain approximately 50% variant fibrinogen. Discovery of this new mutation confirms the association between fibrinogen A alpha chain variant and hereditary renal amyloidosis and establishes a new biochemical subtype of amyloidosis. The propositus is a 53-year-old male who was first noted to have proteinuria at age 43. The proteinuria increased and amyloidosis was diagnosed by a renal biopsy. A liver biopsy at age 51 showed amyloid in the blood vessel walls only. His father died at age 69 due to renal failure, and an autopsy showed amyloid in the kidneys and spleen, but not the liver or heart. His uncle was found to have proteinuria, anemia and hypertension at age 59. He died at age 61. His male cousin was found to have proteinuria at age 61. Renal biopsy confirmed amyloidosis, and he was on hemodialysis at the time this article was written. His 54-year-old brother has proteinuria, but no biopsy has been performed yet. The propositus is a 62-year-old female who was noted to have decreased kidney function at the age of 60, and a renal biopsy confirmed amyloidosis. An echocardiogram also showed some thickening of one wall and valve of her heart. Her 70-year-old brother was noted to have proteinuria at the age of 66. A kidney biopsy showed amyloidosis. Although a cardiac biopsy on the right side showed no evidence of cardiac amyloid, an echocardiogram showed thickening of a wall on the left side and a sparkling appearance suggestive of cardiac amyloidosis. He has been on peritoneal dialysis since the age of 68. Their father died at age 53 of bronchial cancer and their mother died at age 98. Their paternal grandfather died in his fifties of kidney disease. The Methods section of the article goes into great detail on the laboratory processes of isolating fibrinogen from the affected patients, autopsied tissues of deceased patients, and possibly affected relatives. It's totally over my head so I can't even attempt to give a simplified description of how they do it. The Results section of the article describes the actual genetic mutation found in the DNA of the affected individuals. I'll save the complete lesson in genetics for another post, but we have to get into the basic structure of DNA just a little bit in order to discuss these results. The picture below is copied from the article and it shows the DNA sequencing of this section of the fibrinogen gene for a normal (unaffected) individual on the right and for an affected individual on the left. The four basic building blocks (G, A, T and C) are actually in groups of three which form various amino acids. This A to T substitution changes what is normally GAG (glutamic acid) to GTG (valine) at position 526 of the fibrinogen A alpha chain. That is why this particular fibrinogen mutation is often referred to as Glu526Val. All seven of the individuals with renal amyloidosis in these two kindreds had this fibrinogen mutation. They also tested 22 individuals who were at risk of having inherited the mutation and found 13 with the mutation and 9 without it. Since fibrinogen is an important component in the formation of blood clots, they tested clotting times of the affected individuals and found they were all within the normal range. That's good news. They also wanted to determine what percentage of the fibrinogen circulating in the blood was normal fibrinogen and what percentage was mutated fibrinogen. They found it to be essentially 50% normal and 50% mutated. The Discussion section of the article begins by stating there are several known variants of the fibrinogen A alpha chain that are known to cause dysfibrinogenemia, which is a group of inherited disorders that affect blood clotting in various ways depending on the mutation. (As of 2013 there are over 350 different variants.) Since mutations of the fibrinogen A alpha chain typically affect blood clotting, when you tell you doctors you have a fibrinogen mutation do not be surprised if they ask you if there is any impact on blood clotting. (My primary physician asked me.) Based on the information in this article (and others) you can confidently state that this mutation (Glu526Val) does not affect blood clotting. The article then discusses the amyloid deposits themselves. In the 1993 article (above) that describes the Arg554Leu mutation, analysis of the fibrinogen in the amyloid deposits showed that only the variant fibrinogen was present in the amyloid deposits. No tissue was available from any individuals in the kindreds in this article, but the authors say it is likely the amyloid deposits due to this mutation also have only variant fibrinogen. This knowledge will be important in understanding how the amyloid deposits are formed. "The most distinctive feature of amyloidosis in these kindreds is that affected individuals have nephropathy as the major manifestation without evidence of neuropathy." This nephropathy (kidney issues) is in contrast to most types of familial amyloidosis where neuropathy (nervous system issues) is the most common symptom. The article states that only 10 kindreds with hereditary renal amyloidosis have been reported in the literature, and it then gives some basic info on each one, including the mutation if that is known. The article closes with some comparison between these kindreds and others with hereditary renal amyloidosis. It then states that although both of these kindreds are of Irish descent, a common ancestor could not be found. But it is more likely they have a common ancestor than it is that each family had the mutation occur independently. So there you have it. If you have the fibrinogen Glu526Val mutation it means the DNA in a reproductive cell of one of your ancestors was copied with a T instead of an A in one specific position. That one minor error was accurately passed along from generation to generation, eventually giving you the potential for kidney problems late in life. Cause and effect can sometimes be a little strange. The next articles up for review will be some more DNA analysis of other kindreds. We might find which previously reported kindreds with hereditary renal amyloidosis actually ended up having a fibrinogen mutation, and we might find some more fibrinogen mutations as well. (1) Benson MD, Liepnieks J, Uemichi T, Wheeler G, Correa R. Hereditary renal amyloidosis associated with a mutant fibrinogen alpha-chain. Nat Genet 1993; 3: 252-255. (2) Uemichi T, Liepnieks JJ, Benson MD. Hereditary renal amyloidosis with a novel variant fibrinogen. J Clin Invest. 1994;93(2):731-736.